Elliptical galaxies were once thought to be aging star cities whose star-making heyday was billions of years ago. But new observations with NASA's Hubble Space Telescope are helping to show that elliptical galaxies still have some youthful vigor left, thanks to encounters with smaller galaxies. Images of the core of NGC 4150, taken in near-ultraviolet light with the sharp-eyed Wide Field Camera 3 (WFC3), reveal streamers of dust and gas and clumps of young, blue stars that are significantly less than a billion years old. Evidence shows that the star birth was sparked by a merger with a dwarf galaxy. The new study helps bolster the emerging view that most elliptical galaxies have young stars, bringing new life to old galaxies. "Elliptical galaxies were thought to have made all of their stars billions of years ago," says astronomer Mark Crockett of the University of Oxford, leader of the Hubble observations. "They had consumed all their gas to make new stars. Now we are finding evidence of star birth in many elliptical galaxies, fueled mostly by cannibalizing smaller galaxies. "These observations support the theory that galaxies built themselves up over billions of years by collisions with dwarf galaxies," Crockett continues. "NGC 4150 is a dramatic example in our galactic back yard of a common occurrence in the early universe." The Hubble images reveal turbulent activity deep inside the galaxy's core. Clusters of young, blue stars trace a ring around the center that is rotating with the galaxy. The stellar breeding ground is about 1,300 light-years across. Long strands of dust are silhouetted against the yellowish core, which is composed of populations of older stars. From a Hubble analysis of the stars' colors, Crockett and his team calculated that the star-formation boom started about a billion years ago, a comparatively recent event in cosmological history. The galaxy's star-making factory has slowed down since then. "We are seeing this galaxy after the major starburst has occurred," explains team member Joseph Silk of the University of Oxford. "The most massive stars are already gone. The youngest stars are between 50 million and 300 to 400 million years old. By comparison, most of the stars in the galaxy are around 10 billion years old." The encounter that triggered the star birth would have been similar to our Milky Way swallowing the nearby Large Magellanic Cloud. "We believe that a merger with a small, gas-rich galaxy around one billion years ago supplied NGC 4150 with the fuel necessary to form new stars," says team member Sugata Kaviraj of the Imperial College London and the University of Oxford. "The abundance of 'metals' elements heavier than hydrogen and helium in the young stars is very low, suggesting the galaxy that merged with NGC 4150 was also metal poor. This points towards a small, dwarf galaxy, around one-twentieth the mass of NGC 4150." Minor mergers such as this one are more ubiquitous than interactions between hefty galaxies, the astronomers say. For every major encounter, there are probably up to 10 times more frequent clashes between a large and a small galaxy. Major collisions are easier to see because they create incredible fireworks: distorted galaxies, long streamers of gas, and dozens of young star clusters. Smaller interactions are harder to detect because they leave relatively little trace. Over the past five years, however, ground- and space-based telescopes have offered hints of fresh star formation in elliptical galaxies. Ground-based observatories captured the blue glow of stars in elliptical galaxies, and satellites such as the Galaxy Evolution Explorer (GALEX), which looks in far- and near-ultraviolet light, confirmed that the blue glow came from fledgling stars much less than a billion years old. 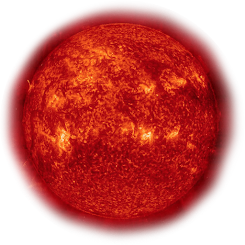 Ultraviolet light traces the glow of hot, young stars. 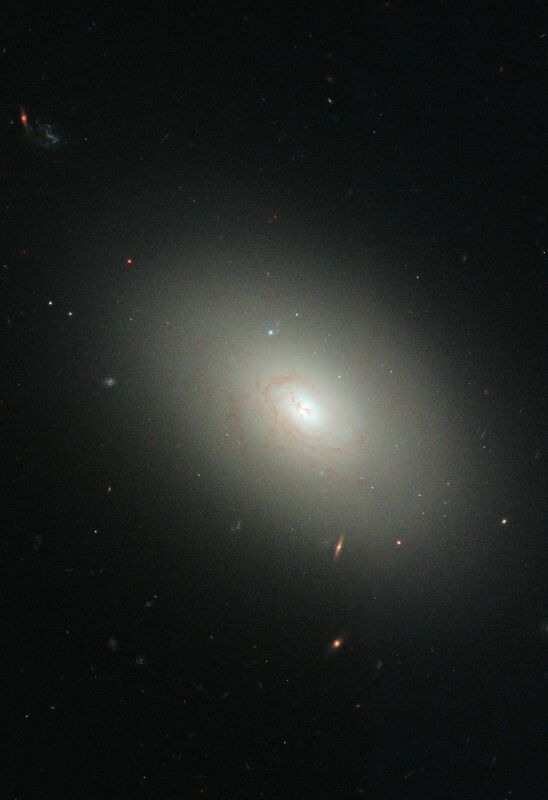 Crockett and his team selected NGC 4150 for their Hubble study because a ground-based spectroscopic analysis gave tantalizing hints that the galaxy's core was not a quiet place. The ground-based survey, called the Spectrographic Areal Unit for Research on Optical Nebulae (SAURON), revealed the presence of young stars and dynamic activity that was out of sync with the galaxy. "In visible light, elliptical galaxies such as NGC 4150 look like normal elliptical galaxies," Silk says. "But the picture changes when we look in ultraviolet light. At least a third of all elliptical galaxies glow with the blue light of young stars." Adds Crockett: "Ellipticals are the perfect laboratory for studying minor mergers in ultraviolet light because they are dominated by old red stars, allowing astronomers to see the faint blue glow of young stars."